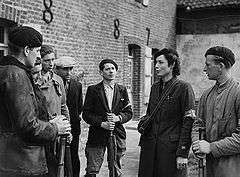 Members of the Maquis in La Tresorerie, 14 September 1944, Boulogne, France. Member of the FFI in Châteaudun. Some heavy armored fighting vehicles were obtained, notably British Cromwell tanks (150 provided by Great Britain) and captured German tanks (44, of which 12 were Panthers). The 12th Regiment of Dragoons received 12 Cavalier tanks among other British equipment in April 1945. In other cases, FFI units used vehicles no longer favored by Allied forces, such as the U.S. M6 Fargo, a light truck with a portee 37 mm antitank gun. Finally, civilian vehicles and practically anything else in running condition were pressed into service and used until they could no longer be maintained. ↑ "Gripe 17" from the 1945 U.S. forces booklet "112 Gripes about the French"
↑ Blumenson, Martin. Breakout and Pursuit, pages 363–364 and 674. Washington DC: Government Printing Office, 1989. These are only two examples of many cited in this volume. ↑ Pogue, Forrest C., The Supreme Command, page 238. Washington DC: Government Printing Office, 1996. ↑ Vernet, J. Le réarmement et la réorganisation de l'armée de terre Française (1943–1946), page 28. Ministere de la Defense, Château de Vincennes, 1980. ↑ De Lattre de Tassigny, Jean. The History of the French First Army, page 170. London: George Allen and Unwin, Ltd., 1952. ↑ Michalon, Roger. Les Grandes Unités Françaises, Volume 6, p. 283. Paris: Imprimerie Nationale, 1980. ↑ Vernet, J. Le réarmement et la réorganisation de l'armée de terre Française (1943–1946), pages 76–77. Ministere de la Defense, Château de Vincennes, 1980. ↑ Gaujac, Paul. L'Armée de la Victoire, Vol. IV, page 161. Charles Lavauzelle, Paris, 1986. ↑ Sumner, Ian. The French Army 1939–45 (2), page 37. Osprey Publishing, London, 1998. ISBN 1-85532-707-4. 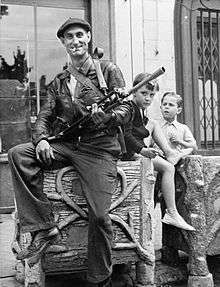 200,000 FFI members in October 1944 were believed to be armed. ↑ Vernet, J. Le réarmement et la réorganisation de l'armée de terre Française (1943–1946), pages 86 and 89. Ministere de la Defense, Château de Vincennes, 1980. Vernet lists 10 divisions that were formed with FFI manpower. Ultimately, some 103 light infantry battalions and six labor battalions were formed with FFI personnel prior to VE Day.